This Friday is Valentine's Day. Wouldn't this be a great week to let someone know what a terrific job they are doing. Or maybe it would be an appropriate time to tell someone how much he or she has inspired or taught you over the years! I bet you already have at least 2 names in your head right now. The trick is to jot down a note of encouragement to those two folks right now and send it! If you are like me, I think of things I should do all day long but at the end of the day, I realize I composed that note in my head but never sent it off. Valentines has always been a special day for me. My first date with my now husband of 41 years was to a church youth Valentine's party; several years later while we were still dating, he gave me a valentine's gift that at first look might seem unromantic — but if you understood the motive was very romantic. He gave me a set of electric curlers-you have to remember I am really old! I thought it was so romantic: I would cut our date short each Saturday night because I needed to go home to "do my hair" for Sunday morning church. With the electric curlers, we could stay out later — wasn't that romantic?! Another couple of years later, he proposed on Valentine's day. This Valentine's week, think not just of the "romantic" side of the day but rather think of the encouraging side of it. Make a commitment to send an encouraging email, note, letter, card, or text to someone who is doing a great job, has made a difference in your life, or just might need a note! Pick up the phone and call someone just to say you are thinking about them. Think of at least one person who you would like to see in SPED ADMIN in the next 5 years and let them know you see a lot of potential in them! Let this Valentine's week be a time to encourage others! One more way to "encourage" others would be to invite those up-and-coming SPED Administrators and educators who have just recently started on the "career ladder" for SPED ADMIN to be a part of your virtual site for the 3rd Annual CASE Hybrid Conference, Feb. 24-26! It is definitely NOT too late to sign up for the Hybrid conference. We will provide you with a flyer you can edit to send out as an invitation to potential attendees. We have compiled a list of hints that our previous virtual sites have suggested to us. We have pretty much done all the "work" and now you can offer a great service to others and look really good! Click here for the FLYER. Click here for the Agenda. To register, Click here! We have seen a brisk sale of CASE NIGHT tickets this week. This year we are taking you out to the ballpark on Thursday, April 10, 2014 when CEC will be in Philadelphia! We will have appetizers, dinner, and lots of fun at a pregame tent party at the Citizens' Bank Park and then we will be sitting together for the Phillies vs. Brewers game! Click here for the flyer and Click here to purchase your tickets! CASE NIGHT sells out almost every year ... don't delay on getting your ticket! See you in Philadelphia! CEC is calling on Congress to reject two legislative proposals that, if enacted into law, would divert public education funding to private schools, which are not required to implement the same Federal legal protections for children and youth with disabilities as public schools. How much IDEA funding is going to your state? Education-1The U.S. Department of Education has released detailed funding tables highlighting each state's allocation for IDEA and other federally funded education programs for fiscal years 2012-2014. Recently, Congressman Bobby Scott, D-Va., — a longtime supporter of programs for children with disabilities — announced his interest in becoming the top Democrat on the Education and the Workforce Committee in the U.S. House of Representatives for the 114th Congress, which begins next January. 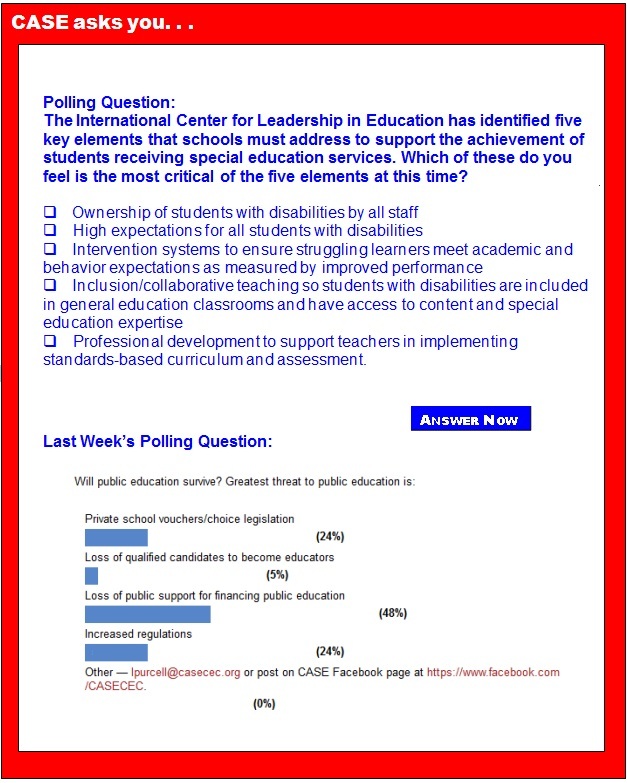 Recent polls: Do educators support the Common Core? There is a lot of misinformation being spread about the Common Core. And some of it the public believes. People with attention deficit hyperactivity disorder are less able to consider the perspective of their conversational partner, says research from the University of Waterloo. The findings may lead to new remediation that can improve the way individuals with the disorder interact and communicate with others. The research appears in two published studies, one in the Journal of Speech, Language, and Hearing Research is focused on children, the other addresses adults and appears in the Journal of Attention Disorders. Score one for a hands-on style of learning, especially among young people. A new survey finds that getting physically involved in learning something trumps reading about it. The results paint a picture of a very different kind of learning than what is typically found in most classrooms. When Melissa Tackett's daughter started first grade at Crockett Elementary School, it quickly became clear she was struggling to learn how to read. Despite a head for math and science, she had trouble memorizing the order of the alphabet, rhyming words and keeping track of phonetic sounds. She struggled remembering which direction each letter and number faced. An extra in-school reading program helped but wasn't enough to catch her up to others. It turned out that Tackett's daughter had dyslexia, something the family found out after expensive testing outside the public school system. Arizona Gov. Jan Brewer used an executive order to strip the name "Common Core" from the state's new math and reading standards for public schools. In the Hawkeye State, the same standards are now called "The Iowa Core." And in Florida, lawmakers want to delete "Common Core" from official documents and replace it with the cheerier-sounding "Next Generation Sunshine State Standards." In the face of growing opposition to the Common Core State Standards — a set of K-12 educational guidelines adopted by most of the country — officials in a handful of states are worried that the brand is already tainted. They're keeping the standards but slapping on fresh names they hope will have greater public appeal. Students with disabilities should be taught to rigorous academic standards, said Deborah S. Delisle, the education department's assistant secretary for elementary and secondary education, in a press conference with reporters on Thursday. Delisle's comments came in response to a question from Joy Resmovits of the Huffington Post, who asked department officials about a proposal in New York to test certain students with disabilities up to two grades below their chronological grade level. This request is part of the state's renewal of its waiver from No Child Left Behind standards. There is a lot of misinformation being spread about the Common Core. And some of it the public believes. The 2013 PDK/Gallup Poll of the Public's Attitudes Towards the Public Schools found that of those who had heard of the Common Core, 49 percent of respondents agree with the false statement that the initiative will create standards in all subjects, and 39 percent agree with the false statement that the Common Core was developed based on a blend of state standards. Four weeks into a medical assistant program at Antonelli College, Nikki Mclendon eagerly took her parents to the college's student appreciation day. The 20-year-old looked forward to discussing her progress and pre-registering for the next term, but instead received devastating news. School officials told the Mclendons their daughter was ineligible to continue. Without warning, the career technical college that accepted Mclendon a year after she finished high school said the "occupational diploma" she'd received from Forrest County Agricultural High School disqualified her. For subjects like math and foreign language, which are traditionally taught in a linear and highly structured context, using more open-ended inquiry-based models can be challenging. Teachers of these subjects may find it hard to break out of linear teaching style because the assumption is that students can't move to more complicated skills before mastering basic ones. But inquiry learning is based on the premise that, with a little bit of structure and guidance, teachers can support students to ask questions that lead them to learn those same important skills — in ways that are meaningful to them. Peter Adams, senior vice president for educational programs at The News Literacy Project, writes: "Every teacher I've worked with over the last five years recalls two kinds of digital experiences with students. The first I think of as digital native moments, when a student uses a piece of technology with almost eerie intuitiveness. As digital natives, today's teens have grown up with these tools and have assimilated their logic. The second I call digital naiveté moments, when a student trusts a source of information that is obviously unreliable"
How do we help children identify as readers? Jamie Zibulsky, Ph.D., an assistant professor of psychology at Fairleigh Dickinson University, writes: "When I was a child, reading was my favorite pasttime. My parents, who are early risers, often reminisce about coming down the stairs of our house before the sun was up, tiptoeing because they thought no one else was awake, and finding me sitting on the floor of my room, reading stories to my stuffed animals. Each day, I read before school and in the evening. When a book was particularly gripping, I could be found reading in the hallways of my school, in the car while being coerced into doing errands, and under my covers with a flashlight. Clearly, I read for my own satisfaction."